A highly tweakable stereo dynamics processor with noise gate, compressor/expander with external side-chain input, and limiter/clipper. From subtle compression, extreme pumping, to maximum loudness! â€¢ High quality 32-bit DSP engine. â€¢ Compressor/expander with optional lookahead buffer. â€¢ Allows negative ratios for pumping/cancellation effects. â€¢ Hard or soft knee with adjustable radius. â€¢ Built-in side-chain low/high cut filters with monitor toggle. 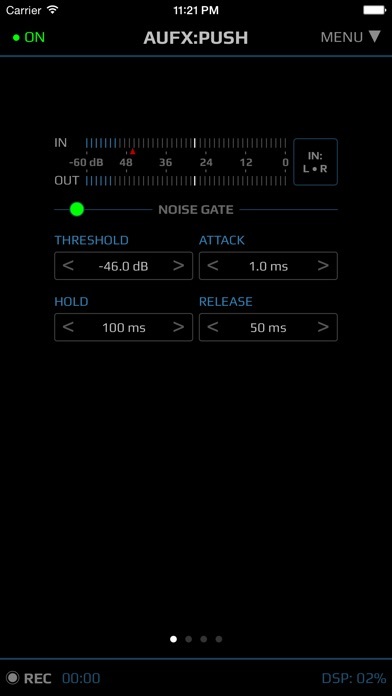 â€¢ External side-chain input through Inter-App Audio or Audiobus. â€¢ RMS/Peak envelope followers with attack, release and hold time. â€¢ Switchable between Linear and Logarithmic mode. â€¢ Process hardware input/output, or other apps through Inter-App Audio or Audiobus (input/filter/output slots supported). â€¢ Save, load and share user presets. â€¢ Supports Audiobus 2 state saving. â€¢ Comes with several bundled presets. â€¢ Fully MIDI controllable, including Virtual MIDI. â€¢ Record the result directly in app. â€¢ Email recordings or export to AudioShare audio document manager app. â€¢ Access user presets and recordings through iTunes File Sharing.